Nothing like having a healthy lunch. You can have a Healthy Salad as a side dish or as a meal by itself. We have used super Veg ingredietns like Paneer, Moong, Masoor, Kale, Feta, Olive Oil. Some of these ingredietns contain good fat which will keep you fuller for a longer time while some ingredients great Antioxidants. 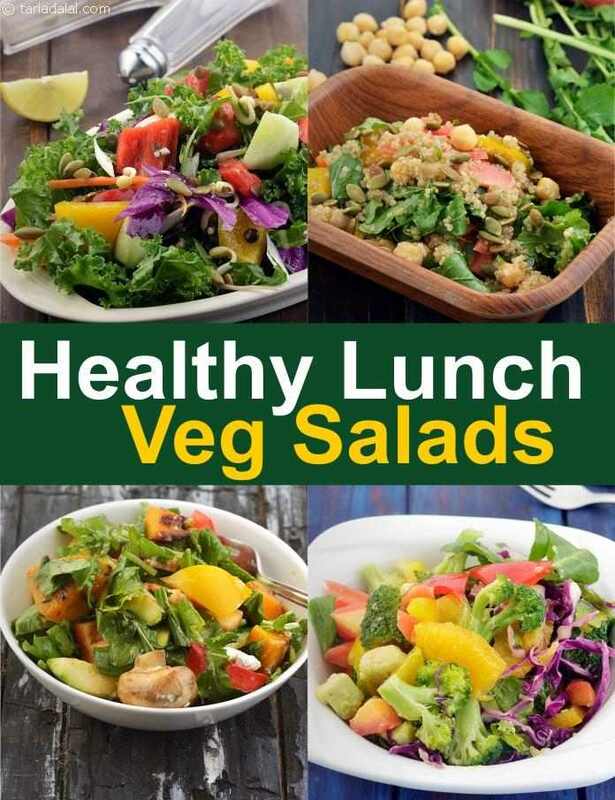 All salads are rich in Vitmin C as most fruits and vegetables are not cooked and maitain their health properites. We have some lovely Salads which are meals by themselves. Some are made with the Indian Pulses like Moong, Masoor like Kale Masoor Salad or with Chawli like Chawli Paneer Salad. Then there is the Vitamin A, Vitamin E Anitoxidant Salad. To get your Protein and Calcium up, toss some these ingredients into your salads like Tomato Basil Feta Salad and Quinoa Paneer Carrot Salad.